How can I search the SSDI on MyTrees? What do if I find a mistake in the SSDI? 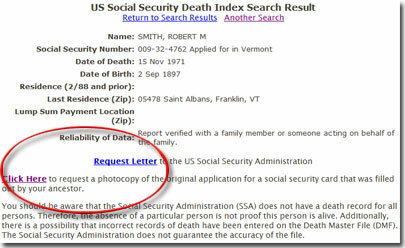 The Social Security Death Index is an index of the Social Security Administration's Master Death File. It includes a listing of all deseased individuals who had a Social Security number and whose death was reported to the Social Security Administration. The SSDI is sold by the SSA to several commercial entities, including MyTrees.com, and can be used to find and verify valuable information about deceased ancestors. It is an index, and as such, it does not contain the full information kept by the SSA. However, it can be used to obtain the details necessary to request a full record (for more information, see What information can I find in the SSDI? and What other information can I request from the Social Security Administration?). The copy of the SSDI available at MyTrees.com is current to May 31, 2012 and contains more than 89 million records. It is included in our free member services and the full SSDI results can be searched and viewed without purchasing a subscription. Social Security number: Along with the full Social Security number, you may also see the state in which the individual lived when he/she originally applied for their Social Security Card. Date of Death: For deaths occurring before 1988, generally only the month and year will be given. The full death date is usually given for deaths that occurred after that time. Date of Birth: Generally, the full birth date will be listed. Residence (2/88 and prior): The place where the individual lived prior to February 1988. Last Residence (Zip): The last residence reported to the SSA before the individual passed away. Lump Sum Payment Location (zip): If benefits were paid to a family member after the individual's death, this field will list the zip code where the final payment was sent. Reliability of Data: This field will state how the information has been verified by the SSA, such as in the above example, where the information was verified by a family member or someone acting on behalf of the family. The SSDI can be accessed from MyTrees by clicking on the "Search" link found at the top of the page. Then click on "Other Searches." Click on the "Extracted Records" link. 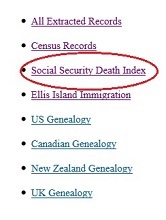 Click on the "Social Security Death Index" link. Your ancestor's death was not reported to the Social Security Administration. The Social Security Act was passed in 1935, so anyone who died prior to that time would not have had a Social Security number and therefore would not be listed in the SSDI. Your ancestor died before 1962. The Social Security Administration's death information was not automated until 1962. Generally, the only time a death that occurred prior to 1962 would be listed in the SSDI is if the death was actually reported to the SSA after 1962. Your ancestor did not participate in the Social Security Program. Your ancestor was an employee of the Federal government. Federal employees participated in the Civil Service Retirement System (CSRS), rather than Social Security, until the 1980's. Survivor death benefits are (or recently were) being paid to your ancestor's dependents or spouse. Their information will mostly likely not be shown in the SSDI until after benefits have stopped being paid. You are searching for someone who died recently. You have misspelled the first or last name or are attempting to use a middle initial in the search. You are searching for a woman under her maiden name, rather than her married name. If she was married more than once, check all of her married names. If you have read through this list and still feel that your ancestor should be listed in the SSDI, but are not able to find them, try broadening your search by entering only a name and death date range. It is possible that something you have specified in your search query does not agree with the SSDI listing and that is preventing the correct record from displaying in your result. Be sure to try alternate spellings or forms of your ancestor's name as well. Even if you can not find your ancestor's name in the SSDI, it is possible that you may be able to obtain information about them from the Social Security Administration by requesting a copy of their Social Security Card Application. 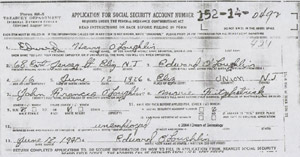 When your ancestor applied for their Social Security Card, they filled out an SS-5 form. As long as the individual is deceased, you can request a copy of that form from the Social Security Administration. The request can now be made online, as well as by mail, and you can specify whether you want to receive a photocopy of the original document or a computer extract of the application. We have provided some links in the SSDI database to help you make your request. When you have found an individual in the SSDI, look at the bottom of the record. There is a link that will take you to the SSA's website, where you can make your request online. You will also see a "Request Letter" link. If you click this link, a letter to the SSA will appear in a small pop-up window, detailing a request for your ancestor's SS-5 form. You can print this letter off, fill in your own personal details, and send it to the Social Security Administration. Whether the individual had ever applied for Social Security or Railroad Retirement before. What do I do if I find a mistake in the SSDI? The SSDI is an index of the Social Security Administration's Master Death File. It is compiled by the SSA and sold to commercial entities, such as MyTrees.com. We place the SSDI online exactly as it is given to us by the SSA. We do not alter or edit the information in the index. If you have found an error in a SSDI record, you will need to contact the Social Security Administration directly, so that they can correct it in their Master Death File. The correction will then be reflected in our version of the SSDI when it is next updated. To contact the SSA, visit their website at http://www.ssa.gov/. The Social Security Act was passed in 1935, so anyone who died prior to that time would not have had a Social Security number and therefore would definitely not be listed in the SSDI. The Social Security Administration's death information was automated in 1962, which began their Master Death File, from which the SSDI is created. So, the SSDI only includes records for individuals whose deaths were reported to the SSDI after that time. There are some records relating to individuals who died before 1962, but generally only if their death was reported to the SSA after 1962. Your letter should include enough information about your ancestor for the Board to be able to identify him in their records. Where possible, include the Social Security number. The Social Security number might be found in the SSDI or on your ancestor's death certificate. If you can not find your ancestor's number, the Board will need his full name (including middle name or initial) and complete dates of birth and death.